Firefighters work daily to save lives from fires, smoke inhalation and other imminent dangers, but in doing so, they put their own lives at risk. Even though fire officials are prepared through a series of physical tests, they still can suffer from heat stress while on the job. More firefighter cooling systems are now available to help restore core body temperatures to the desirable levels where heat stress symptoms are a lesser threat. Heat stress is very dangerous, and if it is not properly diagnosed and assessed, it can lead to heat exhaustion and even death! A normal core body temperature is around 98.6-degrees Fahrenheit. If an individual is experiencing heat exhaustion (or worse, heat stroke) their core body temperatures can rise to more than 101-degrees Fahrenheit (NATA). Heat stress is very dangerous and can lead to heat exhaustion and even death! Firefighters also wear heavy gear that traps moisture and heat and makes it even more difficult for them to stay cool when facing flames or physically stressful situations. This why you’ll often see firefighters working in teams, allowing individuals who have been pushed to their limits have an opportunity to cool off. 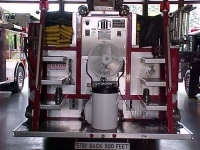 Firefighter cooling systems come in a variety of ways and methods. Advanced Misting Systems provides fire rehab cooling systems and fans to disperse mist to cool a designated area. When the environmental temperature is cooler, it is easier to regulate internal temperatures. The options available at Advanced Misting are portable and have the water and pressure capacity to prove useful in both neighborhood fire situations as well as wildfire scenarios. Other reputable methods include immersion chairs, water bottle and protein bar stations, and even medical attention from paramedics to monitor vitals and administer IV fluids as necessary. According to Firefighter Close Calls, the six R’s of Comprehensive Rehabilitation for firefighters include rest, rehydration, restoration with active cooling, medical monitoring, refueling, and relief. When treating a firefighter for heat stress, it’s important to remove them from the active zone to reduce sensory impact such as harsh sounds or light. Because of their training, they may also have difficulty separating from their duties and responsibilities, so by forcing them to not be immersed in the active zone, they can focus less on the team and more on their own personal health. 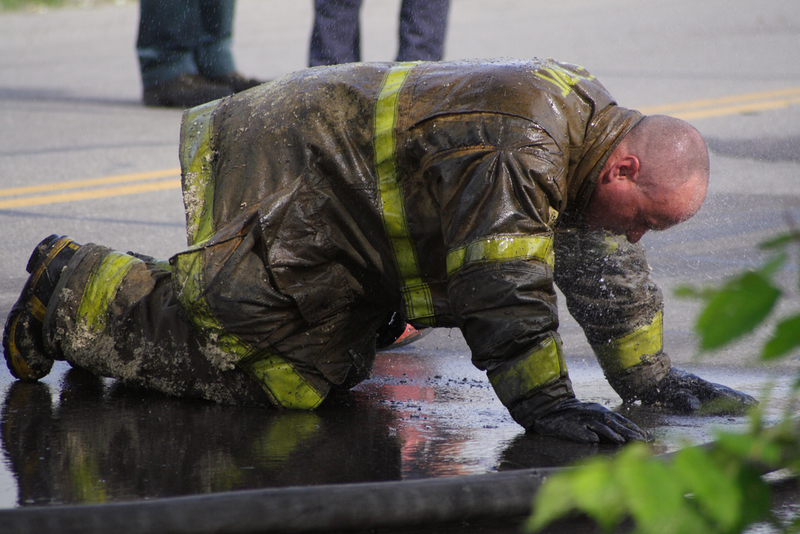 Firefighters are most at risk for dehydration & heat-related health illnesses. Heat stress is very dangerous, and firefighters are some of the most at risk for dehydration and heat-related health illnesses. Advanced Misting Systems respects and values the lives of firefighters. We care so much that we have specific portable products tailored for firefighters. We offer misting fan trailers, as well as a variety of portable personal misting fans with various tank sizes and air pressure output. Shop our many firefighter cooling rehab products online, or learn more about how we can meet your needs by phone at 1.800.549.5077.